Italian Gasket S.p.A. It produces technical rubber items for example: muffs, caps, fairleads, pipettes, lit-tle stoppers, frames, bellows, o-rings which are produced with different raw materials as elastomers, thermoplastics (TPE), bi-components and overprinted items. Simple images to represent data, the materials used, and the data of the three Italian Gasket factories. Italian Gasket SpA produce articoli tecnici di gomma ad esempio: muffole, cappellini, pieghevoli, pipette, chiusure lampo, cornici, soffietti, o-ring prodotte con diverse materie prime come Elastomeri, termoplastici (TPE), bi-componenti e articoli sovrastampati. Le infografiche rappresentano il processo produttivo attuato dall’azienda, i materiali utilizzati, e i dati relativi ai tre stabilimenti Italian Gasket. 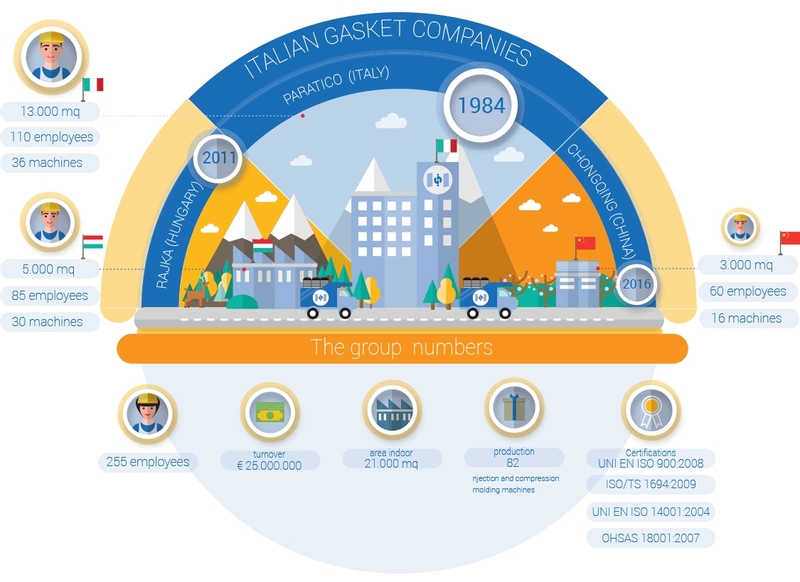 Industry Infographics Italian Gasket S.p.A. It produces technical rubber items (nearly more than 500 mil-lion of pieces) for example: muffs, caps, fairleads, pipettes, lit-tle stoppers, frames, bellows, o-rings which are produced with different raw materials as elastomers, thermoplastics (TPE), bi-components and overprinted items.